Apple Inc.'s (AAPL - Get Report) new iPhone 8 phones and Samsung Electronics Co. Ltd.'s (SSNLF Galaxy Note 8 both have sizable "breakability" risk owing to their glass-backed design, according to a new study. But the iPhone 8 and 8 Plus can withstand more abuse than Samsung's latest smartphone. Electronics warranty provider SquareTrade Inc., owned by Allstate (ALL - Get Report) , tested the breakability of the three new phones. In a report released Sept. 25, SquareTrade said both the iPhone 8 and iPhone 8 Plus outperform the Galaxy Note 8. SquareTrade determined that the iPhone 8 has a breakability score of 67, indicating medium risk, while the iPhone 8 Plus had a medium-high risk score of 74. The Galaxy Note 8's score of 80 indicates high risk, higher even than other Samsung phones. The smaller Galaxy S8 and the Galaxy S8+, scored a 76 and 77, respectively, last month. "It seems that Apple and Samsung have made a choice -- to sacrifice durability in the name of innovation," SquareTrade vice president and global creative director Jason Siciliano said in a statement. Apple switched to a glass case design with the iPhone 8/8 Plus and upcoming X in order to allow for wireless charging, while Samsung's flagship smartphones have sported glass backs and wireless charging for a while. SquareTrade used a different scale and fewer tests when it rated previous versions of each phone on breakability, but the numbers are roughly comparable, according to the company. Last year, the iPhone 7 scored a 50 (medium risk), the iPhone 7 Plus a 60 (medium risk), and the Note7 a 65 (medium risk). In this year's study, when dropped face down, the Note 8 was rendered "completely inoperable" despite only suffering small cracks. In contrast, the two iPhones both developed shattered fronts which rendered them "nearly unusable." The iPhones also outperformed during the "side drop," while the Note 8 nearly broke its camera. In SquareTrade's latest test, the "shot test" which simulates the effects of accidentally driving with your phone left on the roof of a car, all the phones saw "significant damage," with the worst experienced again from the Note 8. The study also found that the iPhones' new glass back make repairs "more difficult and more expensive to repair than previous generations," while the Note 8 is a "tedious phone to repair all around" thanks to its "multiple, fragile inner cables." 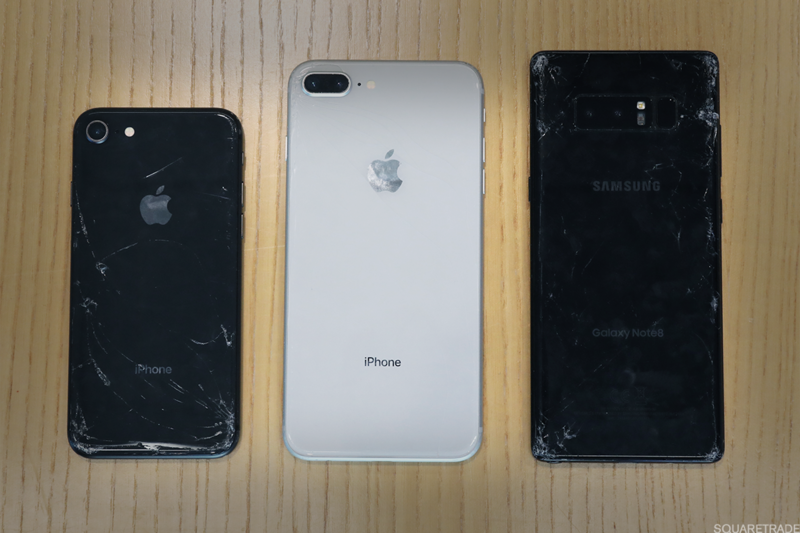 All three phones scored a 70 for repairability. They also tied for audio quality after being submerged in water for 30 minutes, with all three phones surviving the test with distorted sound quality. Longtime Apple analyst Gene Munster, now at Loup Ventures, last week predicted better-than-expected demand for the new Apple phones, citing a proprietary survey. Among respondents who plan to buy an iPhone in the next year, 38% plan to buy an iPhone 8 or 8 Plus, while 25% plan to buy the high-end Apple X, to be released Nov. 3. Apple CEO Tim Cook said last week that demand was solid, even for the new Series 3 Apple Watch, with software bugs to be fixed soon.